Veni, Vidi, Vici was an art exhibition positing iconic Australian flora and fauna as food. “While the show harbours an obvious post-colonial critique of European culture’s annihilation of native environments and species, just as interestingly, it also works to destabilise the role of the “domestic arts”…to create very different, rather subversive outcomes.” – Dan Rule of The Age, Melbourne. “Flake” is a generic term for what was once common gummy shark. Initially bycatch from other fishing, it was commercially caught and marketed, being used for cheap corner store “Fish and Chips”. Currently flake can be one of 6 types of shark or similar fish, and is now expensive due to overfishing. The large scale of the sculpture is used to invoke empathy with such a majestic and often maligned animal. 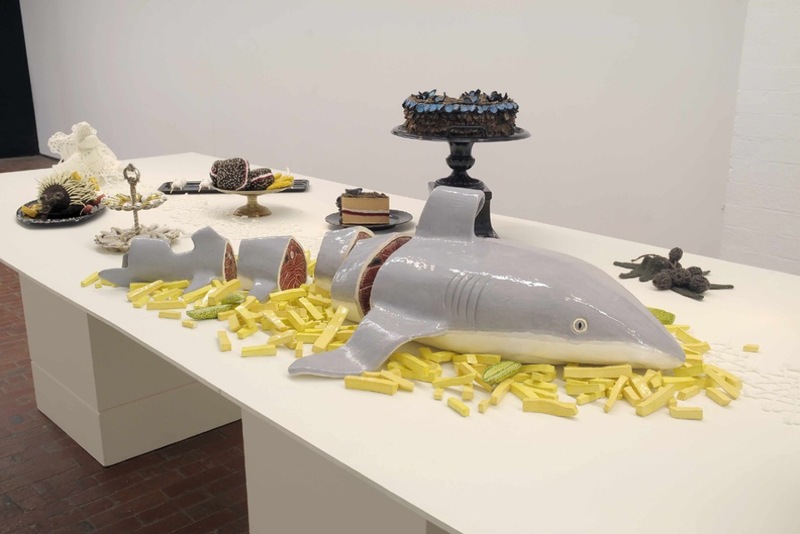 The work also a reference to English artist Damien Hirst’s famous shark sculpture.